Flat out at an average speed of 40mph that’s 19 hours solid driving each way. Seventy Six gallons of fuel… not including the running around… nine or ten tanks of petrol. Too many wallets of dosh. Well it’s a good job we’ve got comfy seats, a top quality entertainment system and air conditioning that works. Please don’t confuse average speed with top speed. I’d be surprised if the average speed was as much as 40mph to be honest. We had decided and planned our trip to France some months ago and had set ourselves a daunting challenge of holidaying in the Carcassonne area in the South of France. 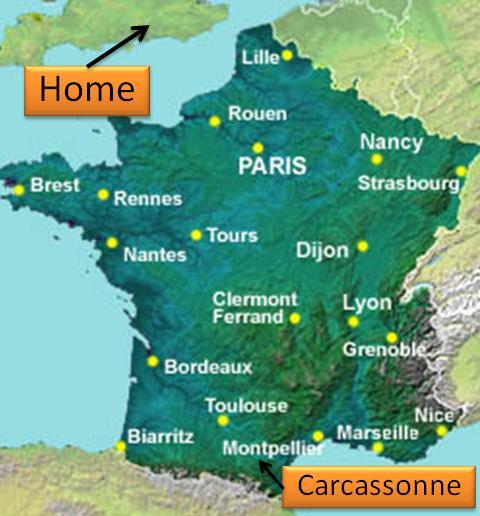 Go look at a map – Carcassonne is about 40 miles from Spain. We were going to drive to the Pyrenees foothills. Lands End to John O’Groats is approximately 850 miles to give an idea of how far we were going. The only place I know that’s further away is Norfolk. Thinking back on it we were naïve to imagine that driving all that way in a 36 year old bus that we barely knew would not have its challenges, worries and problems. I say naïve…. Sarah’s naivety was born out of blissful ignorance, mine was born out of sheer worry. Hey ho, the only way to deal with sheer worry is to just to ignore it and crack on. Sarah was already blissfully ignoring the peril whilst I just buried the worry until I needed it most, that being when it actually happens. Bloke default position. Research Sarah researched and booked most of the accommodation for the trip. We booked the first two en-route nights in advance, the third we would leave to fate. Our aim was to reach Alet le Bain, a small town 15 miles south of Carcassonne, sometime on our third day of hard driving. We would stay there 5 nights. After that a hop-skip-& a-jump up the road to the Gers Department to stay in an isolated six pitch campsite for another 6-7 nights before heading back via some yet to be discovered campsites. We were looking forward this. Ignorance really is bliss and a fundamental ingredient to the romantic road trip we had planned. And why not I ask. Why not…. Why not indeed. [a] I confess I’ve never been to John O’Groats but I’d imagine its more dramatic than Lands End – what with it being in Gods Country. This entry was posted in The SapaBus Blog and tagged Camping, France, Road Trip, VW Bay, VW Campervan, VW Road Trip.